↑ 1.0 1.1 "การประเมินประชากรโลก พ.ศ. 2560". ESA.UN.org (custom data acquired via website). United Nations Department of Economic and Social Affairs, Population Division. สืบค้นเมื่อ 10 กันยายน พ.ศ. 2560. ↑ 2.0 2.1 The first UN General Assembly Resolution regarding the matter, "Question of the Comorian island of Mayotte (PDF)", United Nations General Assembly Resolution A/RES/31/4, (21 October 1976) states "the occupation by France of the Comorian island of Mayotte constitutes a flagrant encroachment on the national unity of the Comorian State, a Member of the United Nations," rejecting the French-administered referendums and condemning French presence in Mayotte. ↑ As defined by the Organization of African Unity, the Movement of Non-Aligned Countries, the Organisation of Islamic Cooperation, and the United Nations General Assembly: the most recent UN General Assembly Resolution regarding the matter, "Question of the Comorian island of Mayotte," United Nations General Assembly Resolution A/RES/49/18, (6 December 1994) states "the results of the referendum of 22 December 1974 were to be considered on a global basis and not island by island,...Reaffirms the sovereignty of the Islamic Federal Republic of the Comoros over the island of Mayotte". Several resolutions expressing similar sentiments were passed between 1977 (31/4) and 1994 (49/18). ↑ "Subjects of UN Security Council Vetoes". Global Policy Forum. Archived from the original on 17 March 2008. สืบค้นเมื่อ 27 March 2008. ↑ "Article 33, Repertory, Supplement 5, vol. II (1970–1978)" (PDF). United Nations, Office of Legal Affairs (OLA). Archived from the original (PDF) on 6 October 2014. ↑ "Anti-French protests in Comoros". BBC News. 27 March 2008. สืบค้นเมื่อ 27 March 2008. ↑ "Comores Online.com – reference to the history of the name". ↑ Thomas Spear (2000). "Early Swahili History Reconsidered". The International Journal of African Historical Studies. Boston University African Studies Center. 33 (2): 257–290. doi:10.2307/220649. JSTOR 220649. ↑ Thomas Spear (2000). "Early Swahili History Reconsidered". The International Journal of African Historical Studies. 33 (2): 264–5. ↑ 12.0 12.1 Thomas Spear (1984). "The Shirazi in Swahili Traditions, Culture, and History". History in Africa. African Studies Association. 11: 291–305. doi:10.2307/3171638. JSTOR 3171638. ↑ 18.0 18.1 Abdourahim Said Bakar (1988). "Small Island Systems: A Case Study of the Comoro Islands". Comparative Education. 24 (2, Special Number (11): Education and Minority Groups): 181–191. doi:10.1080/0305006880240203. ↑ Marlise Simons (5 October 1995). "1,000 French Troops Invade Comoros to Put Down Coup". New York Times. pp. Section A, Page 10, Column 3. ↑ "French Mercenary Gives Up in Comoros Coup". New York Times. Associated Press. 6 October 1995. pp. Section A, Page 7, Column 1. ↑ "COMOROS: COUP LEADER GIVES REASONS FOR COUP". BBC Monitoring Africa (Radio France Internationale). 1 May 1999. ↑ Rodrique Ngowi (3 August 2000). "Breakaway island's ruler says no civilian rule until secession crisis resolved". Associated Press. ↑ "Mbeki flies in to Comoros islands summit in bid to resolve political crisis". Agence France Presse. 20 December 2003. ↑ "Comoros said "calm" after Azali Assoumani declared elected as federal president". BBC Monitoring Africa. 10 May 2002. ↑ UN Integrated Regional Information Networks (15 May 2006). "Comoros; Ahmed Abdallah Sambi Set to Win Presidency by a Landslide". AllAfrica, Inc. Africa News. ↑ "COMOROS: The legacy of a Big Man on a small island". IRIN. ↑ "Comoros 2001 (rev. 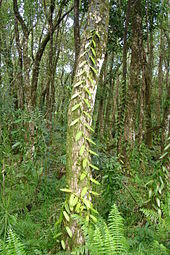 2009)". Constitute. สืบค้นเมื่อ 23 April 2015. ↑ 33.0 33.1 "FUNDAMENTAL LAW OF THE UNION OF COMOROS (English excerpts)" (Word document). Centre for Human Rights, University of Pretoria, South Africa. ↑ "COMOROS: Reforming 'the coup-coup islands'". IRIN. 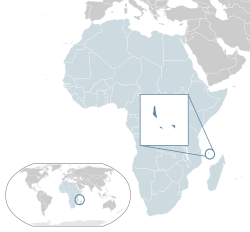 ↑ "Comoros: Referendum Approves Downscaling of Government". AllAfrica Global Media. 19 May 2009. สืบค้นเมื่อ 20 May 2009. ↑ Security Council S/PV. 1888 para 247 S/11967   Archived 17 March 2008 at the Wayback Machine. ↑ "Forty-ninth session: Agenda item 36: 49/18. 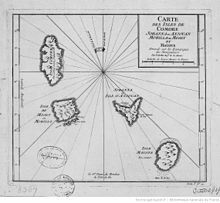 Question of the Comorian island of Mayotte" (PDF). United Nations General Assembly. 6 December 1994. Archived from the original (PDF) on 27 May 2008. ↑ Ratha, Dilip; Sanket Mohapatra; Ani Silwal (2011). "The Migration and Remittances Factbook 2011: Comoros" (PDF). Worldbank.org. สืบค้นเมื่อ 29 November 2016. ↑ 44.0 44.1 Office of the General Commissioner for Planning, Ministry of Planning and Regional Development (October 2005). "UNION OF THE COMOROS: POVERTY REDUCTION AND GROWTH STRATEGY PAPER (UPDATED INTERIM PAPER)" (PDF). ↑ "Comoros: Financial Sector Profile". mfw4a.org. Archived from the original on 13 May 2011. สืบค้นเมื่อ 15 January 2011. ↑ "Rural Poverty Portal". ruralpovertyportal.org. ↑ "OHADA.com: The business law portal in Africa". สืบค้นเมื่อ 22 March 2009. ↑ Population Division of the Department of Economic and Social Affairs of the United Nations Secretariat (2005) World Population Prospects: The 2004 Revision and World Urbanization Prospects: The 2005 Revision. ↑ "FACTBOX-Relations between France and Comoros". Reuters. 27 March 2008. ↑ Mohamed Ahmed-Chamanga (2010). Introduction à la grammaire structurale du comorien. Moroni: Komedit. ↑ "The World Factbook — Central Intelligence Agency". cia.gov. 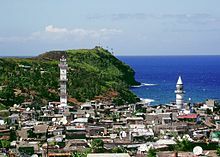 ↑ "CIA World Factbook: Comoros". Cia.gov. สืบค้นเมื่อ 15 January 2011. ↑ "WHO Country Offices in the WHO African Region – WHO Regional Office for Africa" (PDF). Afro.who.int. สืบค้นเมื่อ 1 June 2010. ↑ "Comoros". 2005 Findings on the Worst Forms of Child Labor. Bureau of International Labor Affairs, U.S. Department of Labor (2006). This article incorporates text from this source, which is in the public domain. ↑ "Union of Comoros". Arab Cultural Trust. สืบค้นเมื่อ 29 November 2016. ↑ "Comoros Islands: Islands & Beyond". 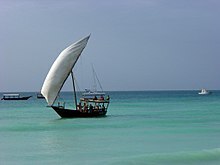 comoros-islands.com. สืบค้นเมื่อ 29 November 2016. ↑ "Accueil – Al-Watwan, quotidien comorien, actualités et informations des Comores". หน้านี้แก้ไขล่าสุดเมื่อวันที่ 19 มีนาคม 2562 เวลา 02:19 น.